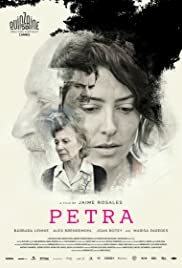 Director: Jaime RosalesWriters: Michel Gaztambide, Clara RoquetStars: Bárbara Lennie, Alex Brendemühl, Joan BoteySummary: The identity of Petra's father has been hidden from her all her life. When her mother dies, Petra embarks on a quest which leads to Jaume, a celebrated artist and a powerful, ruthless man. As she searches for the truth, Petra meets Marisa, Jaume's wife, and their son Lucas. Gradually the stories of these characters intertwine in a spiral of malice, family secrets and violence, which will drive them all to the edge. But fate's cruel logic is derailed by a twist that opens a path to hope and redemption.